Is there a better alternative to Quotient? Is Quotient really the best app in Mathematics category? Will Quotient work good on macOS 10.13.4? Fixed a bug that prevented the online help from loading. Made the main window resizable once more. Increased the height of the main window. Added an adjustable slider between the quotient and repetend text views. Rearranged the main window slightly. Fixed an oversight in the AppleScript terminology. Quotient needs a rating. Be the first to rate this app and get the discussion started! 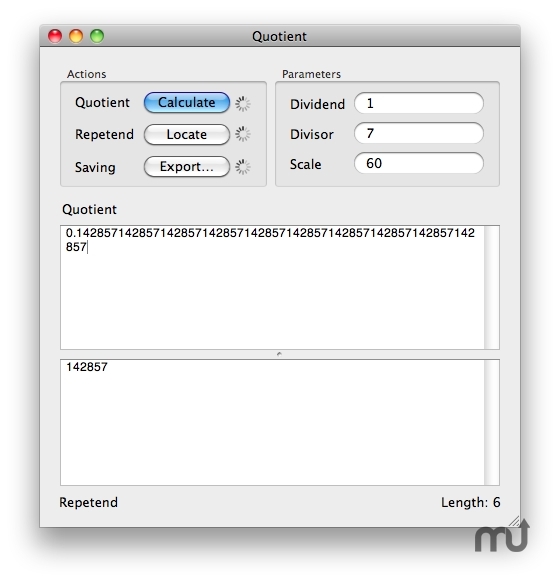 A quotient may extend off the screen of your calculator, such as when you divide 1 by 7. It turns out, however, that at least some part of what follows the decimal point repeats indefinitely. This program writes the quotient of any integer division, to a user-specified level of decimal precision, into a text box, from where it can be copied to the Clipboard, or exported (along with the rest of the calculation parameters) to a text file. A repetend locator rounds out the program's functionality, employing an algorithm with the ability to determine a repeating end-segment portion in any finite-length string, which the result text box then displays. Indexed the online help, as it should have been initially. Updated the online help to full-fledged XHTML. Window is now a fixed size; this makes sense from the standpoint of the width of the text fields, and also fixes some sizing issues with the split view. Remade in Objective-C 2.0; the program is no longer compatible with systems prior to Mac OS X version 10.5 ("Leopard"). Updated contact information in online help. Other minor changes to both UI and code.